By now I am hoping that you have all seen Winnie the Pooh, which came out on July 15th, 2011. As some of you may know, I had the unique opportunity to go to Los Angeles for a special screening of the film and to meet with cast members, directors, the producer, and some of the animators. 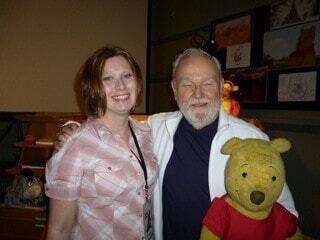 One of the animators that we got to meet was Burny Mattinson. 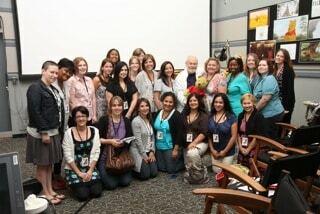 Burny has been with Walt Disney Studios since 1953. His first job for Disney was in the mail room, but he had aspirations of becoming an animator one day. The first film he worked on at Walt Disney was Lady and the Tramp drawing filler pictures between the key frames. 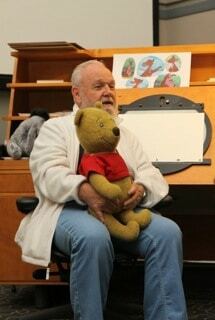 Eventually he moved on to work as a character animator, and actually worked on the original Winnie the Pooh. If you have a copy of the new movie at home, you should watch that opening scene again and take another look at the Winnie the Pooh doll. Such a great Disney story, isn’t it?